Building a single, trusted view of suppliers remains a challenge for many organizations, especially when each team — such as procurement, supply chain, and supplier management — is often grappling with distinct, siloed systems and applications across departments, regions, and business units. By standardizing and automating workflows for onboarding and collaborating with suppliers, teams can not only improve efficiency and enhance supplier lifecycle management, performance, but reduce compliance risk. 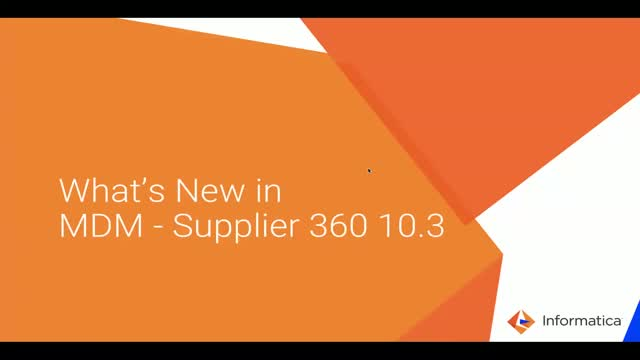 Informatica MDM – Supplier 360 is a master-data fueled business solution that helps companies more efficiently collaborate with suppliers and improve their ability to assess compliance, performance and risk of their vendors by accessing a next-gen, 360-degree view of supplier data across the enterprise.